When creating a Windows 10 reference image a common issue is that the store updates will autoupdate while you are busy installing software updates and applications. This then causes sysprep to fail in giant ball of fire. To solve this there are basically two options and for some option one doesn’t seem to work which is why I always opt for option two. Option 2, is to use a WSUS and then disable internet access for the duration of the build. This can easily be achieved using PowerShell and a sprinkle of magic. Here is how! Lets start with creating a small PowerShell Script. Save that into as Invoke-InternetAccess.ps1 and place the file into the MDT deployment share script folder. Now time to set the sequence. Add two “Run PowerShell script” steps as shown below. All done! Now you can run your sequence and not worry about any store updates during your build. 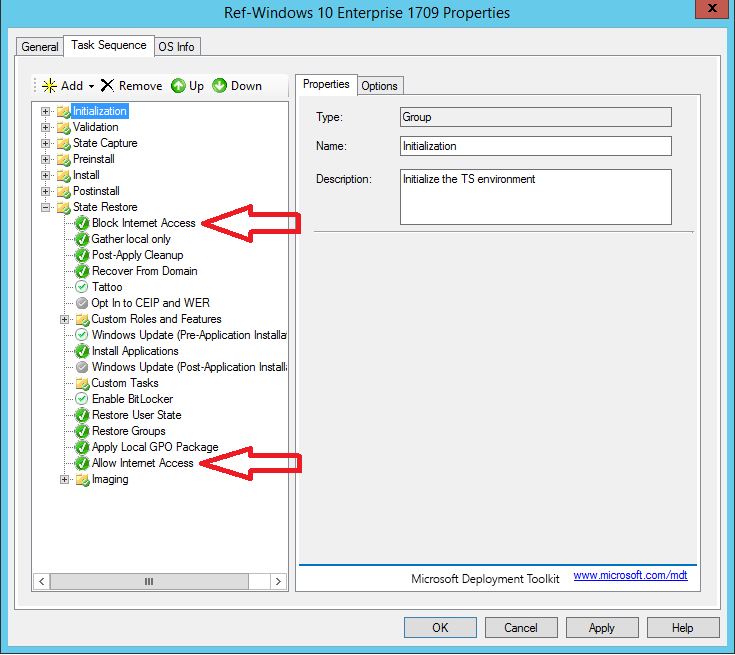 There has been some discussion around this and there is an alternative to the way below which will work if you use MDT. The solution is a simple as it is elegant and requires very little configuration. All you would need is to set HideShell=YES in your customsettings.ini. This will not load a full explorer and hence store will not start and there will be no store updates downloaded.